Knowing about design patterns enables developers to improve their code base, promoting code reuse and making their design more robust. This book focuses on the practical aspects of programming in .NET. You will learn about some of the relevant design patterns (and their application) that are most widely used. We start with classic object-oriented programming (OOP) techniques, evaluate parallel programming and concurrency models, enhance implementations by mixing OOP and functional programming, and finally to the reactive programming model where functional programming and OOP are used in synergy to write better code. Throughout this book, we’ll show you how to deal with architecture/design techniques, GoF patterns, relevant patterns from other catalogs, functional programming, and reactive programming techniques. After reading this book, you will be able to convincingly leverage these design patterns (factory pattern, builder pattern, prototype pattern, adapter pattern, facade pattern, decorator pattern, observer pattern and so on) for your programs. You will also be able to write fluid functional code in .NET that would leverage concurrency and parallelism! 2: WHY WE NEED DESIGN PATTERNS? 11: WHAT IS REACTIVE PROGRAMMING? Avoiding pitfalls when creating compositional, readable, and maintainable code using imperative, functional, and reactive code. Praseed Pai has been working in the software industry for the last 25 years, starting his career as a MS-DOS systems programmer using ANSI C. He has been actively involved in developing large-scale, cross-platform, native code-based systems using C++ on Windows, GNU Linux, and macOS X. He has experience in COM+ and CORBA programming using C++. In the last decade, he has worked with Java- and .NET-based systems. He is the primary implementer of the SLANG4.net compilation system, which has been ported to C++ with an LLVM backend. 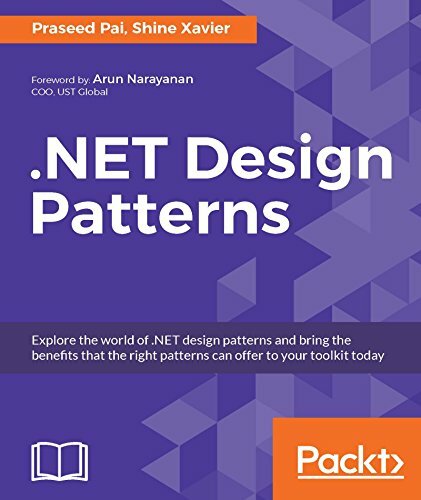 He coauthored .NET Design Patterns, by Packt Publishing.